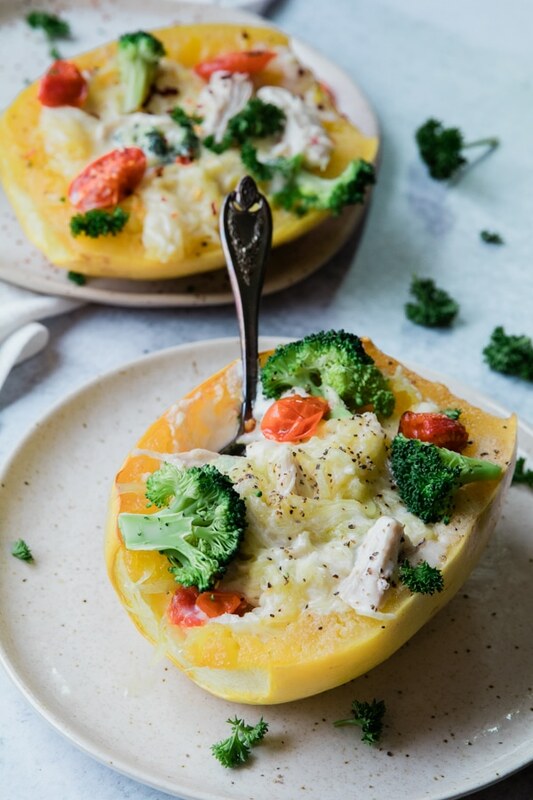 Spaghetti Squash Chicken Alfredo is an easy and healthy way to enjoy a classic comforting dish but without all of the pasta! Doesn’t January seem to drag on forever? I feel like it’s been January for 73 days now! I’m not complaining, it just always seems to be like a long month, do you agree?! It’s been a great start to 2019 and I’m excited to see what the next 11 months have in store. As far as what’s in store for Kroll’s Korner, you will be getting more and more DINNER recipes for me. That is my main focus for the blog because YOU requested it. From a survey I sent out in my newsletter (pssst have you signed up for that yet?) and from a survey I hosted on my Instagram stories, the majority of you are here to find DINNER recipes! Using a very sharp knife, cut about 1/2 inch off from the top and bottom of the spaghetti squash. Then stand your spaghetti squash up on the flat surface/side you just created and cut the spaghetti squash in half. This is the hardest part – be very careful or ask for help! Once you cut it in half, scoop out the seeds (like a pumpkin!) and discard. Season with olive oil, salt, pepper and garlic salt. Place facing down (or skin side UP) on a baking sheet lined with foil. Bake for 30-45 minutes, or until you can easily poke a fork through the squash. 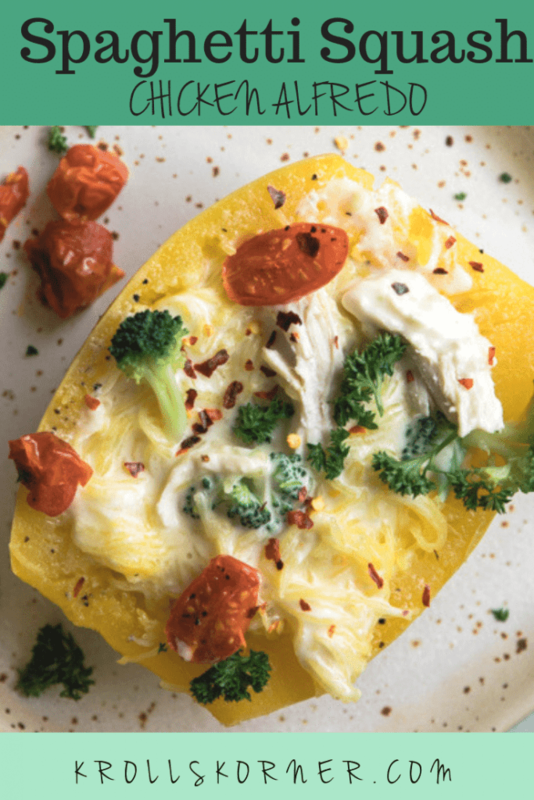 A healthy twist on a classic dish! 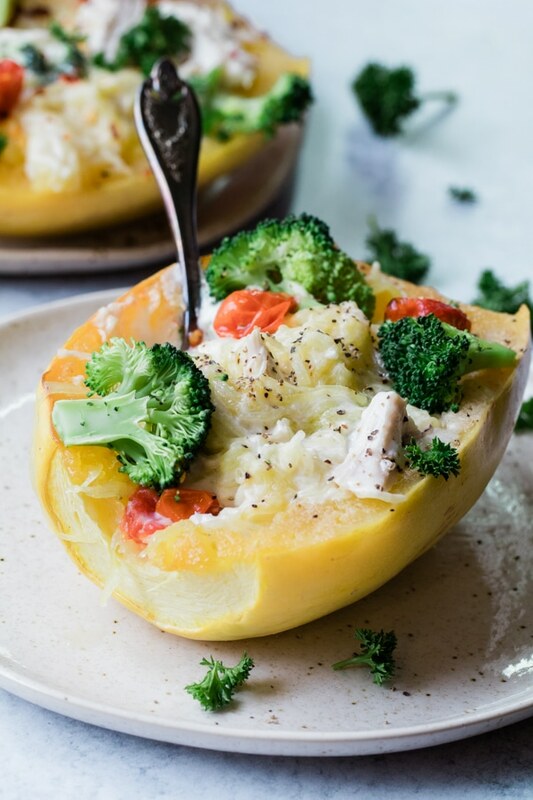 Using Spaghetti Squash for chicken alfredo results in an easy and healthy weeknight dinner recipe! Add the garlic and sage and cook for 30 seconds. Stir in the flour and cook for 30 seconds, stirring constantly. Whisk in the chicken broth and half in half. Stir in the cubed cream cheese and Parmesan until smooth. Add in the shredded chicken and steamed broccoli. Stir. Fluff some of the spaghetti squash noodles up, and spoon the Alfredo mixture into each half of the spaghetti squash. Top with fresh parley and enjoy! For the chicken I cooked it in lemon juice, olive oil, and garlic powder. 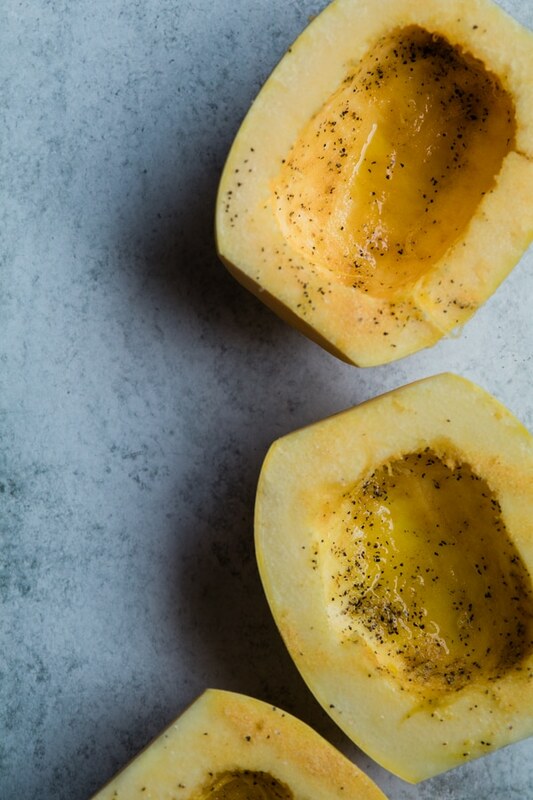 I also seasoned the spaghetti squash with olive oil, salt and pepper before I cooked it! If you make this recipe – I’d love for you to tag @krolls_korner so I can see your creations! 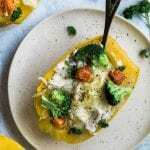 PIN THIS SPAGHETTI SQUASH CHICKEN ALFREDO FOR LATER! Yum, this looks amazing! I will definitely be trying this soon! Hahaha I have another spaghetti squash in the kitchen waiting to be eaten!